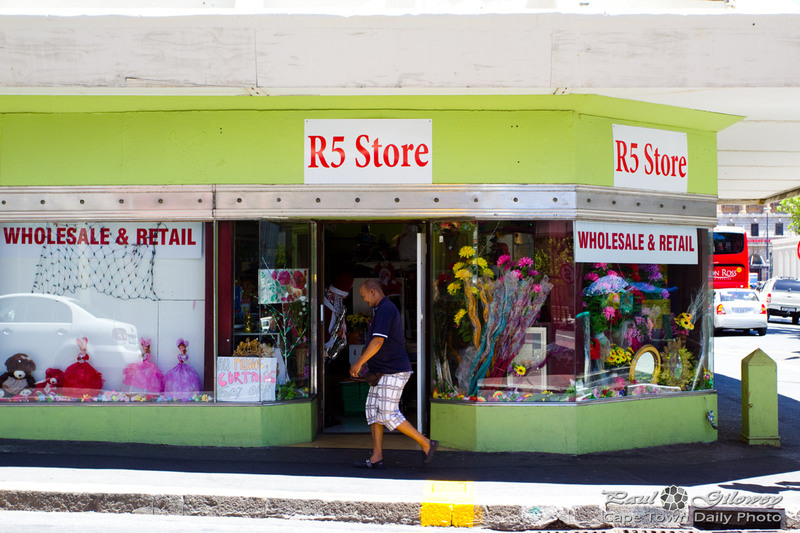 A store where all products cost R5. Let me put that into perspective - at today's exchange rate that's $0.50 and about £0.30. I never crossed the road to actually walk inside and take a look. But I can't imagine that the 50%-off pillows and curtains sign in the window could mean that they'd be selling curtains for R2.50, or could it? And, could that mirror, the frame, and those flowers all cost R5 each? That's insane. I'll make a mental note to inspect the store next time I'm in the area! Posted in General and tagged city, plein street, shops on Saturday, 22 February, 2014 by Paul. When these stores first started appearing they did actually have nothing costing more than the R5 or R10 of the name though they might bundle cheaper items to several for R5. I’ve noticed lately that these names just seem to be generic for cheap stores and don’t always relate to the price of their goods.